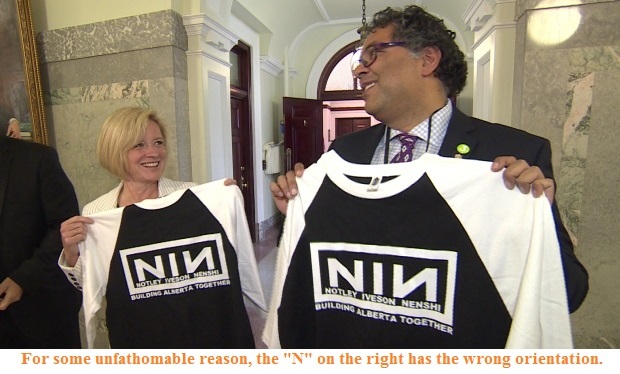 Surprise, surprise: a cowardly socialist mayor, a socialist mayor who lives like a princess, and Edmonton's most offensive politician had a great time when they got together to discuss how they were going to rob Albertans. Nenshi also threw his support behind the government's proposed hike of the minimum wage to $15 an hour. He urged the government to be thoughtful in how it phases in the increases, because of the potential impact on small business. However, Nenshi said the initiative could help reduce poverty and allow working people to have better lives. It's still mind-boggling, incidentally, how the same far-left economic illiterates who insist that minimum wage doesn't hurt businesses are also so wary about raising the minimum wage too quickly and "shocking" businesses. Either it hurts, or it doesn't. Unfortunately, these three don't have enough brain cells between them to wonder about that, and you won't get the CBC asking them such questions.